The following is a 1000 yard 22-250 ballistic chart that was created using our free online ballistic calculator and details all aspects of the bullets trajectory from the millisecond it leaves the barrel until the time it reaches the 1,000 yd mark. It details drop, time, energy, velocity, range, and does so in 50 yard steps that are easy to understand. The stats are generated using a .22-250 Remington, Remington AccuTip, 50gr with a ballistic coefficient of 0.242 being fired at a velocity of 3799 from muzzle point blank, this also takes into account the standard 1.5" scope height, and a gun that has been sighted in at 100 yards. If your 22-250 isn't close to these specs, or if you are a sniper or into long range shots you may want to take this a step further and use our ballistic calculator to create a custom 22-250 ballistic chart to take into account variances, and even choose the correct bullet. You can then also add atmospheric condition, angles, and compare bullet projections. 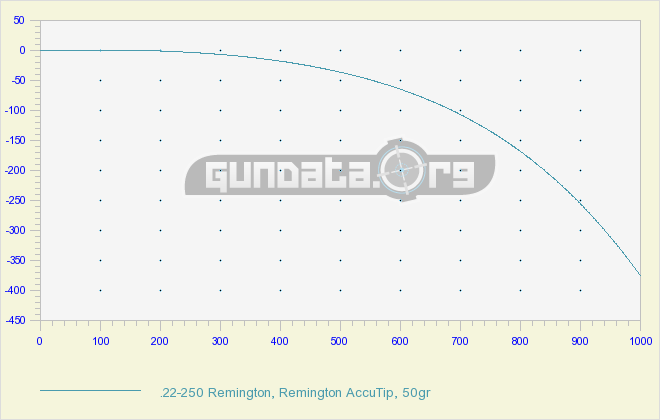 So what does the charting of the 22-250 Remington's external ballistics tell us exactly? It says that at around the halfway point of 500 yards the bullet will have slowed by 1918fps that is standard reduction is speed compared to say the .223 Remington that would have only lost 1733fps from initial 3239. This bullet at 500 yards still has some speed at 1881fps.